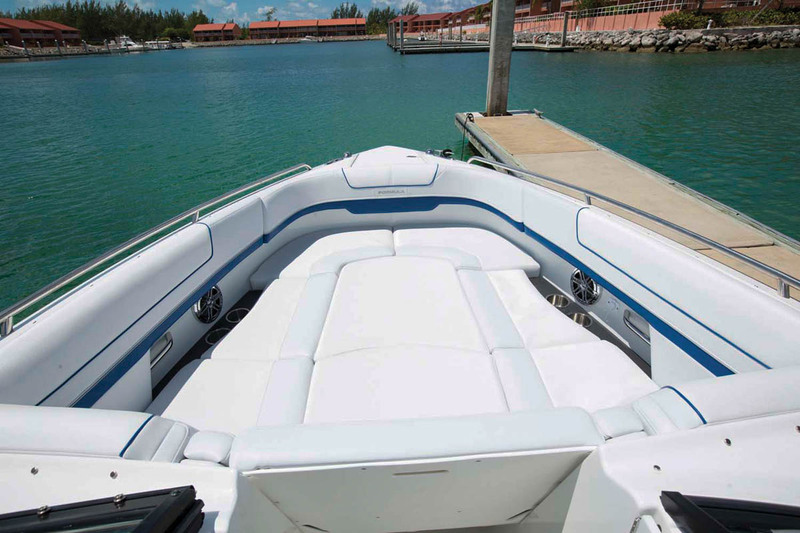 The 310 BR is a bowrider that can cruise to the sandbar … or the Bahamas … in style. At the heart of the new seating scheme are individually articulating backrests, both at the helm and at the stern. This maximizes passenger comfort and flexibility whether the key is on or off. At the helm, Formula retained the doublewide crew seating, which is a great feature for cruising, because it allows occupants to have a conversation without yelling across the 310’s 9-foot, 6-inch beam. The copilot can flip his individual seatback forward and move behind to have a rear-facing seat to spot skiers or tubers or chat with passengers aft. At rest, the captain can join the cockpit social zone by doing the same. To crank the relaxation factor up a notch, drop the ginormous cockpit table down and put a cushion on top, so people on the U-lounge can kick up their feet or stretch out to catch some rays. An identical table up in the bowriding section performs the same trick. The seat bottoms up front have a removable middle section, so instead of two people reclining, at least five riders can sit and place their feet on the deck. At the stern, instead of a one-piece backrest, there are two that allow each person hanging out to determine his optimal comfort position, and one or both can face front or back. While this arrangement provides flexibility, some owners may prefer the original seating arrangement, which allows two passengers to sit, facing aft, behind the captain and co-pilot. 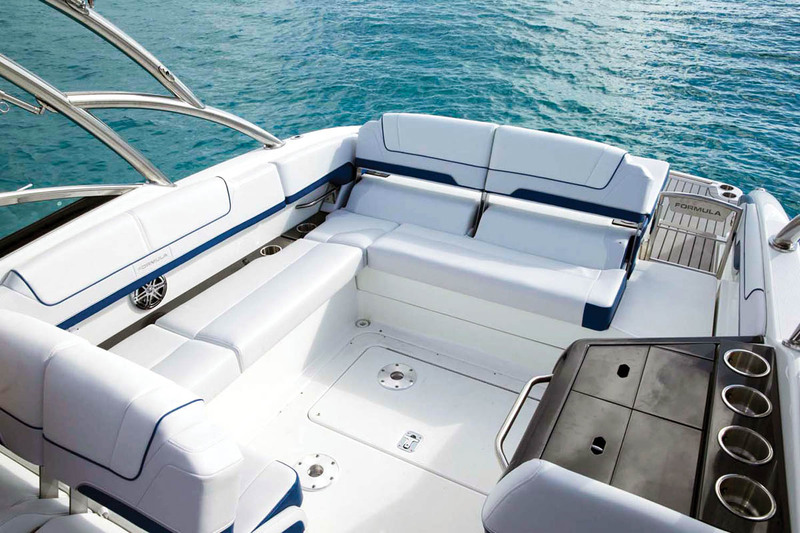 For them, the 310 FX BR is available and features a more exotic helm and interior design. Many builders with sterndrive-powered boats give owners a choice of one brand to choose from. Lucky buyers will find a builder that allows them to choose between MerCruiser or Volvo Penta, but Formula ups the ante with a third choice: Ilmor, which earned its stripes building racing engines for offshore racers and land-based circuits such as Indy Racing and NASCAR. 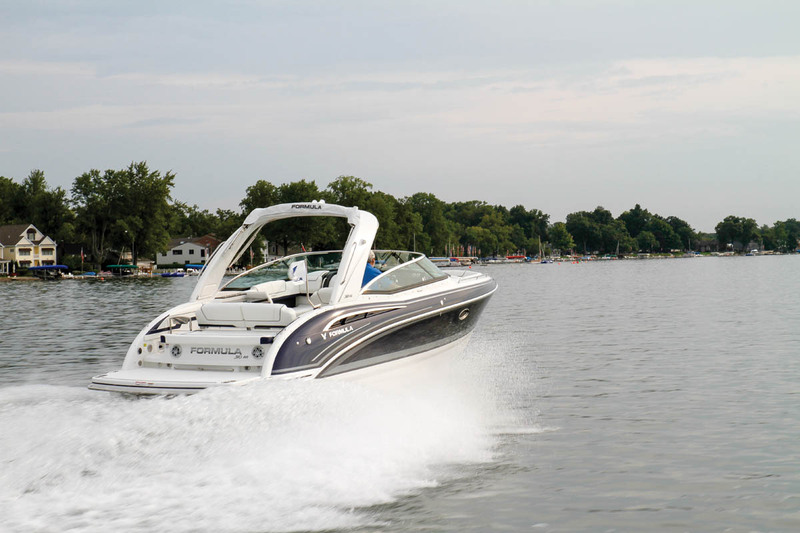 For the 310 Bowrider, buyers have 10 choices of dual-engine power, starting with a pair of 300 hp 6.2L MerCruisers (the standard engine package) or 5.3L Volvo Pentas. On the opposite end of the power spectrum is a trio of 430 hp options from the aforementioned manufacturers. Our test boat showed that the upper-middle power echelon will provide all the thrills an owner could want without blowing up the already significant price tag, which starts at $272,790 with a pair of 300 hp MerCruiser 6.2L engines. Our boat had the MerCruiser 8.2L 380 hp motors, which increased the price by $19,150 but had a significant impact on performance. Formula estimates this boat, with the standard setup, will have a top speed in the 47 to 49 mph range. With 160 hp more, the 310 BR reached 58.9 mph, which, for a 9,875-pound boat, is pretty fast. Out of the hole, it performed very well, considering it has 22 degrees of deadrise at the stern, which tends to settle a boat deeper in the water than a flatter stern. Deploying the standard Bennett hydraulic trim tabs down made a huge difference in time to plane and bowrise. Without them, the bow came up high enough to lose the horizon for a second or two as I timed it to plane in 4.9 seconds. With the tabs deployed, time to plane was reduced to three seconds with very little bowrise. Once the boat was on plane, killing the tabs allowed it to accelerate in a very linear and smooth fashion to 30 mph in 7.5 seconds. Most of the time I prefer calm conditions for testing a boat, but rougher conditions are my preference with a Formula test. Like other Formula boats I’ve tested, the 310 BR’s balance is excellent. And making constant adjustments to get the trim just right won’t occupy all of the driver’s time on this boat. MerCruiser has done away with the dreaded learning curve. Its Active Trim feature does it automatically, to keep the boat running at its optimal attitude, with the simple push a button. Of course, this boat tends to run fairly level, so the auto trim isn’t working too hard. 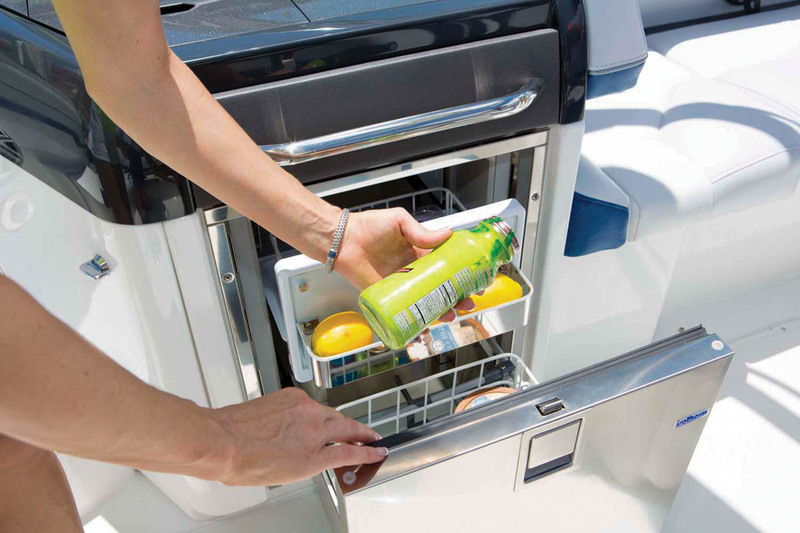 But even experienced boaters will take whatever assistance they can get, especially when it’s MerCruiser’s Joystick Piloting for Sterndrives system ($18,705). With it engaged, the driver can perform any docking maneuver necessary, including going sideways, which will come in handy when it’s time to fit this 33-foot, 11-inch (with extended swim platform) boat into a 35-foot space. Another great feature is Sky Hook, which will keep the boat stationary without having to deploy the anchor. Some drivers (and passengers) might be taken by surprise the first time they whip the 310 BR into a hard turn at speed, because it has a solid grip on the water and leans pretty steeply into the corner. It hooks up really well and performs a 180 easily, but until one learns its tendencies, it’s better to ease off the throttle a bit going into a turn and accelerate on the exit. This boat is so much fun to drive, the passengers might have to yell at the driver to stop because he passed the sandbar. If that’s the case, he can pull out the skis or tubes and keep them entertained — and extend his driving time. If buyers want an arch for the cool factor, one is available for $8,610. If watersports are an absolute, there’s a stainless steel sport top with a Sunbrella top, a wakeboard tow point and a mast light, for $14,120. At speeds around 21 mph, the 310 BR puts out a well-formed wakeboard wake, and there’s plenty of room for skis in the in-floor compartment. The 310 BR is a great entertainer, whether while idling around or coving. 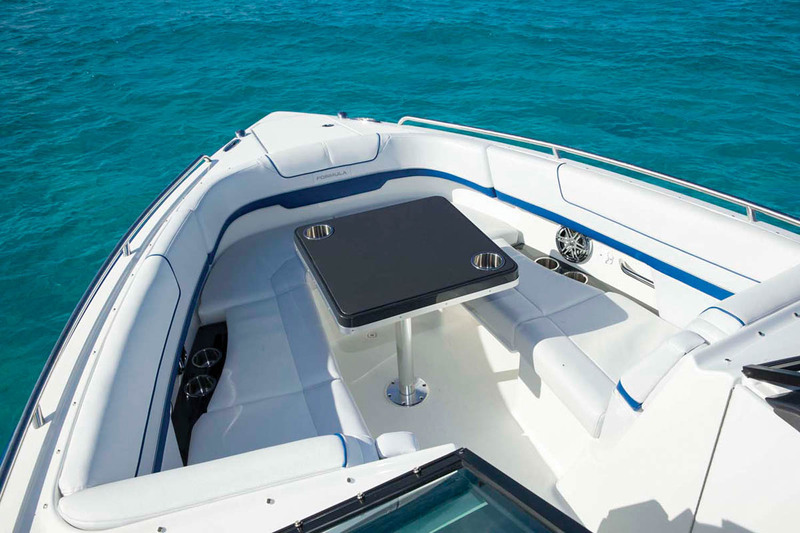 To port is a large entertainment center with four cupholders (17 in all) and a large Corian working surface. Underneath is a 30-quart cooler, but buyers can option up to a refrigerator for $2,105. While it’s an option, we’re pretty sure few boats leave the factory without the extended swim platform ($7,930), which doesn’t look like an add-on and has a clean look, since the ladder is hidden underneath. 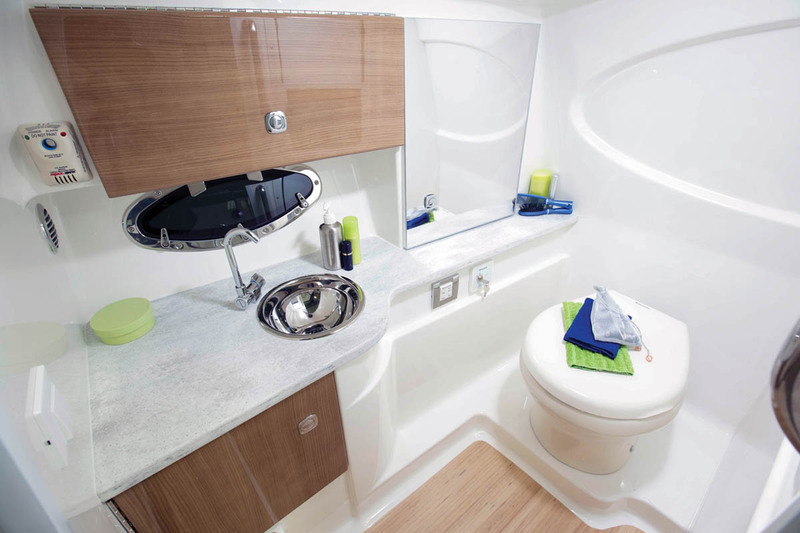 The standard Formula 310 BR is about as far from a standard boat as I’ve seen, with features such as its yacht-like wood-decked, standup head compartment complete with a pumpout, a 36-gallon holding capacity and a vanity with a sink that’s fed by a 29-gallon tank. 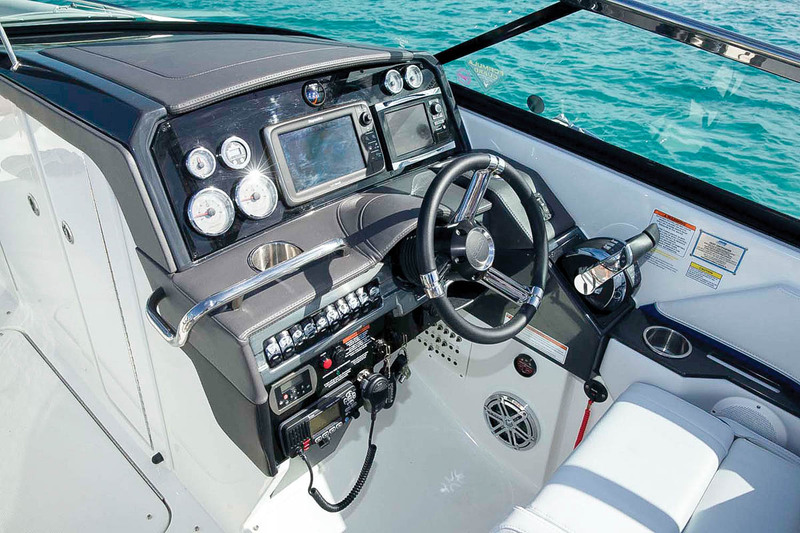 The helm is turnkey, featuring Livorsi gauges, a Raymarine eS78 chartplotter, a digital depthsounder and a leather-wrapped wheel. The standard six-speaker, 400-watt Clarion Bluetooth is good, but the premium stereo is a JL audio unit with a subwoofer and lighted speakers ($1,340) that rocks with the best. Standard decking is snap-in carpeting, but a host of vinyl options come at a $14,530 upcharge. On a premium boat like this, the crew would look a little weird manually handling an anchor, so the windlass is a must-have $6,155 option that comes with 75 feet of chain and a polished stainless steel plow anchor that doubles as a hood ornament. One of Formula’s signature features is the high-end Imron gelcoat it uses. The standard finish is heads and tails above that on most other boats, but the Flagship Fusion metallic finishes ($10,210) are conversation starters. We have the tonneau cover for protection when we aren’t using it, but we wish it were easier to put on. We’ve been boaters for about 40 years but most of our experience is on lakes in Tennessee, where we used to live. We moved to Cape Coral on the southwest coast of Florida and wanted something larger that could handle the open waters of the Gulf of Mexico. We’d always owned Sea Rays but were blown away by the styling and quality of the Formula 310 BR. One feature that was very important was the Axius Joystick system, which gives us the confidence to handle this boat in tight quarters. 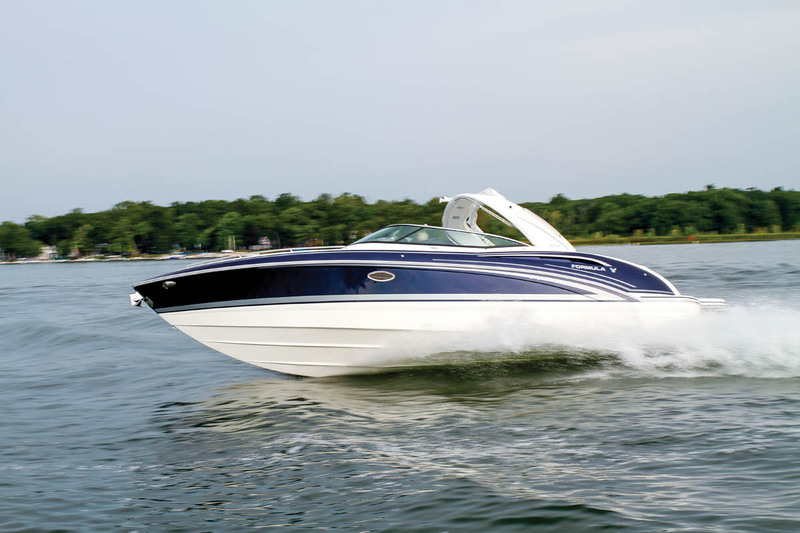 With twin 6.2L 350 hp engines, this boat performs like a sports car. We do a lot of day cruising to places such as Ft. Myers Beach and are looking forward to taking some longer trips. We love taking friends out on the boat and entertaining them at places like Woody’s Waterfront, Lighthouse Restaurant and Bayfront Bistro. Our experience with Formula Boats South has been outstanding. 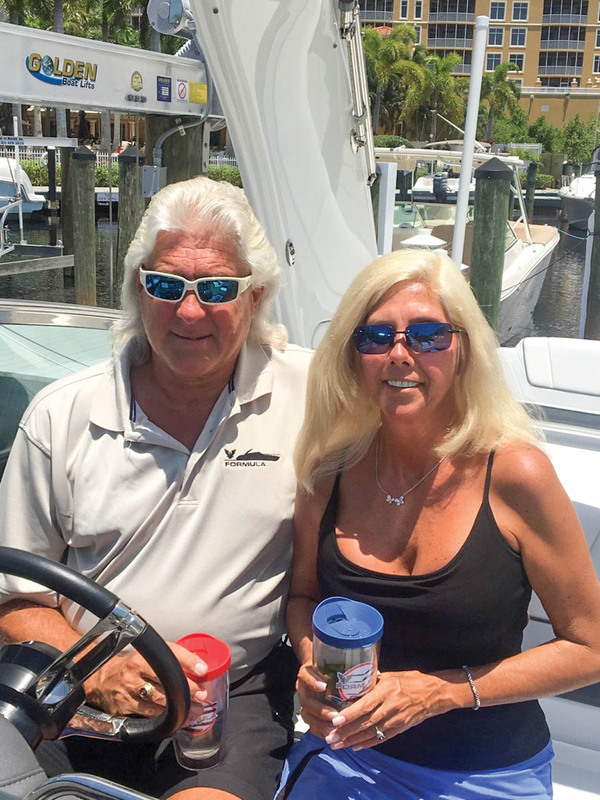 Scott and Steve have made buying a boat a fun experience, as it should be, and they’ve taken good care of us after the sale with outstanding dockside service.